In honor of its release author Renee Watson and illustrator Shadra Strickland were both kind enough to answer some questions. A Place Where Hurriances Happen is Watson's debut though only by a few weeks. She has a middle grade novel called What Momma Left Me coming out in July. This is Strickland's second solo project. For her first Bird by Zetta Elliott, Strickland won the Coretta Scott King John Steptoe award for new talent. She is the first female illustrator to win this award. Strickland also won Ezra Jack Keats illustrator award. Hello ladies congratulations on a wonderful picture book. Can you please tell please us a little about yourself? Watson I grew up in Portland, Oregon and have always participated in the arts. Growing up I sang in my church’s choir, I acted in school plays, and wrote for the school newspaper and literary magazine. I currently live in New York City. When I’m not writing, I am working as a teaching artist in public schools. Strickland I finished Syracuse University and earned my MFA at SVA. After grad school I worked part time as a designer at a major publishing house. I currently live and work in Atlanta, GA (my hometown) after being in New York for six years. I am currently illustrating full time but do hope to teach again in the future. Random facts: I love bowling, dancing, reading and spending time with my family and friends. Renee, What exactly is a teaching artist? It’s the same as being an artist-in-residence. I work for a non-profit organization, DreamYard. DreamYard hires professional artists—writers, dancers, musicians, performers, visual artists—and places us in public schools in the Bronx to provide yearlong workshops to students. How do students react to visits from professional artist? I get all kinds of reactions from students when I first come to their classroom. Some are thrilled and some are not. But for the most part, by the end, students have grown and tried new things. I try to use the arts to encourage young people to see their world and respond to it in a creative way. This is empowering for students and so by the end of a residency many of them have found a new way to express themselves and those who were already expressing themselves and exploring the arts leave with new skills and techniques to fine-tune their raw talent. This past year, it was very exciting for me to be in the classroom because I was able to bring in excerpts from the book and share it with my middle school students at MS 390. They were able to learn how a picture book goes from being a typed document on my computer to a hard cover, illustrated book. My students got to see the black and white pencil sketches, the f&g, and finally, the hard cover book. I think having me in their class demystified what it means to be a professional artist. Did you write this story during or in the aftermath of hurricane Katrina? Or did you need some distance from the tragedy before you put words to paper? I went to New Orleans in 2006, a year after Katrina, to work with children coping with coping with the aftermath. After leaving New Orleans, I wrote in my journal a lot about my experience, but I didn’t start writing the book until about five months after I returned. Their stories stayed with me and I wanted to honor their voices, celebrate their resilience. A Place Where Hurricanes Happen is a very fitting title. Since this story is about four friends who live on the same New Orleans street. As bad as the Katrina is it doesn't define them. Was the focus on the friends rather than the hurricane a conscious decision? I ask this because while watching the news coverage of Katrina , sometimes I got the feeling that the Black people of New Orleans were looked upon as different. A Place Where Hurricanes Happen is testimony that all kids are the same no matter their ethnic or religious background or where they live. Focusing on the friends and their everyday life was definitely a deliberate decision. My hope is that this book touches children from all walks of life who maybe haven’t lived through a natural disaster, but have had to move and start a new school, or has a favorite thing they do with their mom or a friend, or who’ve lost a grandparent and need to find someone else who shares their story. Though the book is first and foremost for New Orleans, it is also for children everywhere and above all, about overcoming hardships and having pride in where you’re from. They definitely have pride in neighborhood. There is also a great sense of community. The book got a great blurb from Caroline Kennedy. How did you react when you found out? Once I knew Caroline Kennedy was reading the book and might offer a blurb, I was nervous. At that time, besides my close friends and the editorial team at Random House, I hadn’t shared the book with anyone so it was one of those moments of knowing my work is out there in the world, being read, being critiqued—and hopefully enjoyed. Once I received her blurb, of course, I was extremely honored. Since this is a picture book debut, I thought it would be nice to allow one question from an aspiring picture book author. So the next question comes from Jeannine. When writing about a heavy topic like hurricanes, how do you find the balance of telling what happens and also being mindful of the age group you are writing for? I just keep trying to see everything through a child's prespective. I read section out loud over and over to hear the voices of the characters to make sure the language was stated in a way a child would say it. I also made it a point to balance out the sadness by starting and ending with joy. Can you tell us a little about working with children dealing with the aftermath of hurricane Katrina? The organization, Sani Anyanwu, held an arts camp every summer. After Katrina, the director of the program wanted to use the arts to help students process what they had been through. A year later, wounds were still very fresh. Using the arts as the vehicle to get students talking was powerful. Poetry and theater provides an outlet for young people to express themselves and process what they’re going through. And for children of color who seldom go to therapy for any of the traumas they experience, the arts provide a safe space for them to heal. In our workshops, students not only processed what they loss, but they celebrated their rich culture. It was a time for children to vent their anger, ask their questions, mourn their loss, and celebrate home. What did you think when you found out Shadra was the selected artist? I was so excited to collaborate with Shadra! When my editor told me they would be approaching her, I think I told everyone I knew to pray that she’d say yes. Shadra did you get to see Renee's story in its entirely before you sent sample illustrations? Ironically, I wanted to work on a story that paid tribute to the people of New Orleans (specifically after Katrina). I tried writing something of my own before the project came along, but nothing was working out. Serendipity smiled on me and Renée's story landed in my lap. How long did it take you to visualize the four friends? It didn't take long at all to visualize the friends. The beauty of Renée's story is that each character has a very distinct voice and personality. They were all pretty easy to see in my head. When I looked for models, I was lucky enough to find children whose personality's felt really similar to what I was able to capture in my thumbnail sketches. Where do you find models? I used to teach and am still really good friends with people who work in schools. Often times when I am on a school visit I am also scouting models. Most times I am lucky enough to work with children and parents who are excited about books and seeing themselves in the pages. Sometimes I make characters up. My goal, even when using models is to capture the "feeling" of a character. I build characters through their gestures and expressions so it's never about copying directly from a photo, the key for me is to capture the essence and feeling of the characters I illustrate. How do you decide what medium to use for a particular story? I choose mediums based on the feeling I get from the story. I usually paint in watercolor and gouache, but depending on where the story takes me different things get dropped in. In BIRD, Mehkai's drawing's were a part of his world, so it made sense to me that I juxtapose watercolor with ball point pen against a charcoal city setting. Hurricanes were a lot trickier because it was more straightforward (if that makes any sense). The paintings were all done in watercolor and gouache. I had to rely much more on color and composition but still think about each character's voice and how to keep them separate but make them all work together homogeneously. I did get to experiment a little with crayon and saran wrap in the storm pieces which was a real treat, and in the scene where Keesha is cooking with her mom, I used soap bubbles and watercolor to show the energy of spicy jambalaya. The jambalaya looked good enough to eat. I thought the storm came out very well. One of the things I love and appreciate about art (in any form) is catching the small moments and details. Illustration for me is very much about capturing those universal magic moments in everyday life. In A Place Where Hurricanes it was so important to try and show each character's individuality in their solo moments throughout the book. From our introduction of the four in the opening spread, their gestures speak volumes to who I felt these kids were in the world (I hope ;-)). We hear their voices in all of Renée's words, and it was important to me to match those voices in the illustrations. My next book is much more playful and in turn I will play with collage and watercolor. This is a very good pairing. The text and illustrations have that much more of an impact, together. I love collage. What is the name of your next project? I am working on many things at once these days which is a blessing and a huge responsibility. The project that I am wrapping up now is called White Water and is due out with Candlewick next year. The collage project that I am working now is called Sunday Shopping and is with Lee and Low. I'm really excited to switch things up visually and add more to my visual vocabulary. Were you able to take a trip to New Orleans? Yes. New Orleans was the fifth character in the book. I had never visited prior to the project and knew that in order to do this story justice I would have to walk the streets of the city and talk to some of the people living there. If I hadn't actually seen, smelled, tasted, and listened to the city I don't think that the story would have been visually believable. 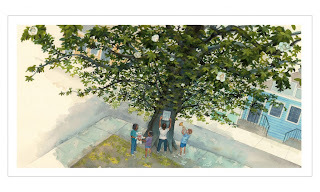 There are little things in the art that I just wouldn't have seen or paid attention to from internet research, like the mardi gras tree that ended the story, the distinct personality of the homes, the giant shady tree in the opening spread– I was walking down the street when I came across that tree and immediately thought, "that is totally where we will meet our characters". Visiting the city personalized the story for me even more which helped me personalize the art as opposed to regurgitating images from the news. Authors and illustrators don't always get a chance to meet even though they working on the same project. Did you two get to meet in person? Strickland - Unfortunately I left NY before Renée and I met. We did have a phone date which went very well. We will meet this fall for the first time when we visit schools in New Orleans and share the work. Renee your free verse is beautiful. One of my favorites - when Michael is with his younger sister during the hurricane. Shadra your depiction of Micheal and his younger sister Jasmine in that moment is powerful. Every time I look at the text and illustration on that page I am moved and amazed by it. Its gorgeous all around. Strickland - Thank you, that is one of my favorite illustrations. To answer your question, I hope they respond to both. Of course, a picture is more immediate than text. I think that if the images grab the reader they will be more inclined to study the text and gain more meaning from the work. But I also think it depends on the child. I'm a visual person so with picturebooks I do tend to read the art first. The goal though is to have the art and words work together. For example, one of my all time favorite picturebooks is Come on Rain by Karen Hesse; illustrated by Jon J. Muth. The writing and watercolors are delicate, moody, sophisticated and look deceptively simple all at once. It's so wonderful to hear the characters speak through the text as well as the images. I love the book as a whole. I am a big fan of Muth's. Next time I go to the library, I will look for Come On Rain. Renee has a great teacher's guide for A Place Where Hurricanes Happen on her site. Do you think you two will incorporate the on going Gulf Oil Spill into the activities with the New Orleans students? Watson - Shadra and I are still working out the details of what our workshops and activities will be when we go to New Orleans. I usually ask the school or host site what they would like me to cover, so my school visits vary depending on the school’s needs and interest. Strickland - Uggggghhhh! This oil disaster is terrifying and frustrating! Because hurricanes deal with a very scary time in a lot of people's lives no doubt the kids will open up and talk about the things that are going on in their world that scare them. I won't be surprised if the oil spill comes up in conversation. I would love to hear their thoughts on how to stop the leak and what we can do in the future to avoid these types of crises. Thanks for running the interview Doret; great questions! I am so glad you and Zetta have been featuring A Place Where Hurricanes Happen! I have one more question though if the author is reading this. Ever since I heard about this book I have been wondering if the title came from "My Fair Lady!" Jill - I had no idea Zetta was featuring A Place Where Hurricanes Happen as well. It was a very nice surprise. I am up on a few musicals but not My Fair Lady. I just checked two soundtrack verisons didn't see a title with hurricanes in it. Though on You Tube I did see My Fair Lady - Hurricanes Hardly Ever Happen. 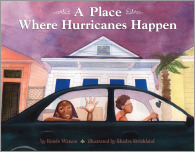 Thanks Shadra - A Place Where Hurricanes Happen is a great book I was more then happy to do it. Ditto what Shadra said--thank you Doret! The title is a phrase from the collaborative poem students wrote about where they were from. It started with, "We're from New Orleans a place where hurricanes happen..." so I used it as a title.